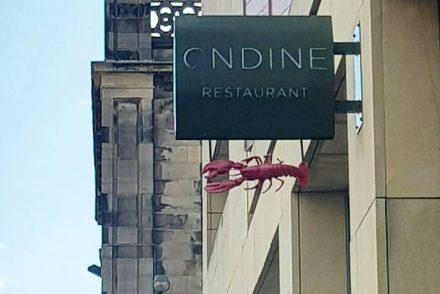 Everyone has a favourite place, right? It could be a favourite city, a favourite country, it could be your kitchen. Somewhere where you feel truly peaceful and happy. I have many places I love… London, Amsterdam, Edinburgh, New York, Pollenca in Mallorca, Nashville, New Orleans, Thailand. I have had many wonderful times in each place and they all hold a special place in my heart. One particular place that has gripped my heart and won’t let go is Bali in Indonesia. I was incredibly fortunate to be ‘sent’ to Bali for a month in 2013 for work. I couldn’t believe my luck and I appreciated every second of it. 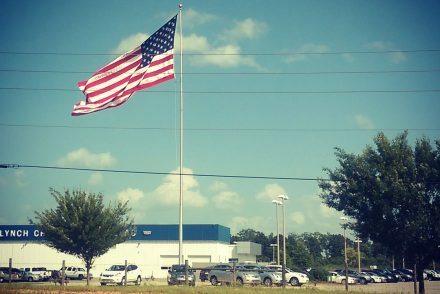 Every day I would stop what I was doing and look around, taking it all in and thanking what ever higher being allowed me to have this incredible opportunity. That month was life changing for me, and I have thought about it every day since. I had quite a big birthday in 2016 and I was dreading it. I was a miserable cow for the 12 months leading up to it. Seriously, I was a pain in the arse to be around. I knew I had to plan something spectacular for my birthday so I could look forward to that instead of dreading the big day. My first thought was “I want to be happy. Where am I happiest?” and I thought of Bali. And so I booked a trip to Bali! 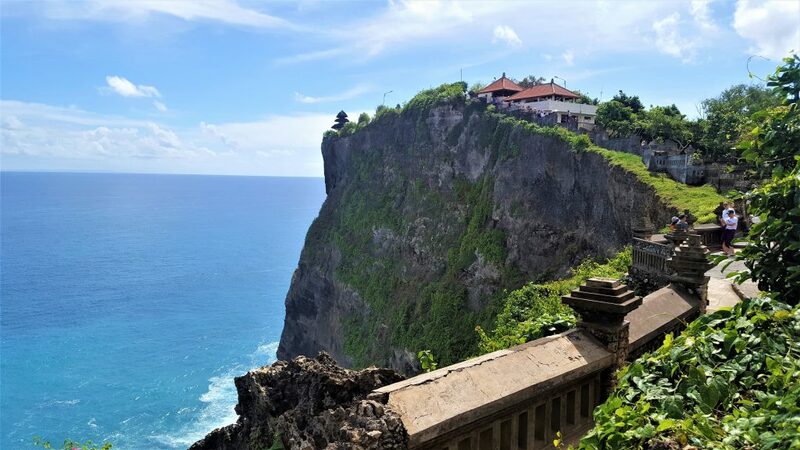 When I was working there a few years ago, I was based in Tanah Lot, on the Southern West coast of the island and then Nusa Dua, on the eastern side of the Bukit Peninsula at the southern tip of Bali. I was privileged enough to be staying in one of the many 5* hotels that line the stunning beach, but I worked 30 out of 31 days so didn’t get to see much of the area or the island. 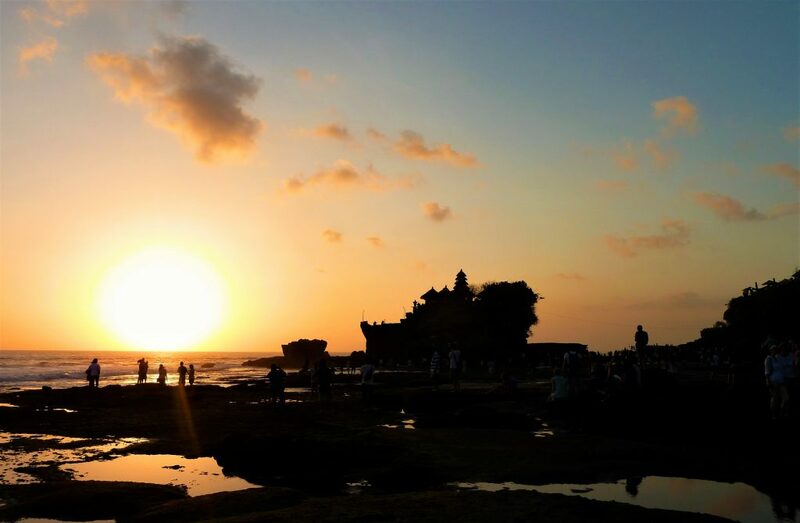 However, I did get to experience the breathtaking sunsets each night as well as the famous Tanah Lot Temple, both so beautiful I wanted to cry. This time round, I wanted to explore. So over the two weeks, I planned to visit four different areas. One place I was told to experience by everyone I mentioned the trip to was the Gili Islands. These are a short boat ride from Bali and technically part of the much larger neighbouring island of Lombok. 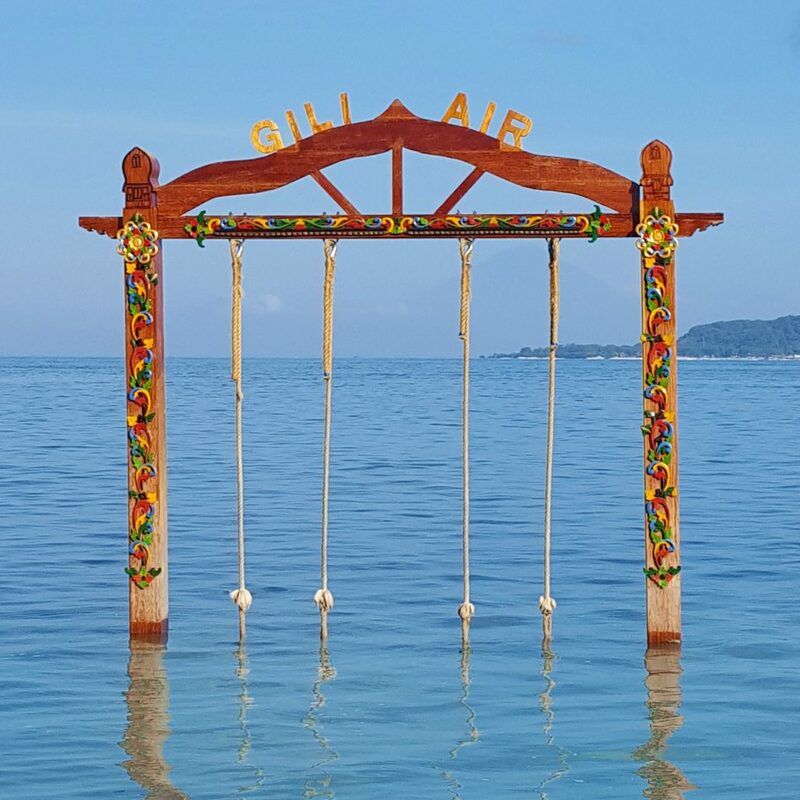 The Gili Islands are a group of 3 tiny rustic, bohemian islands…Gili Trawangan (more commonly known as Gili T), Gili Meno and Gili Air. They are known for their coral reefs and terrific scuba diving. On the smallest island, Gili Meno, sea turtles swim at Turtle Point. It is super chilled, has no nightlife and is known as the ‘honeymoon island’ for its secluded atmosphere. 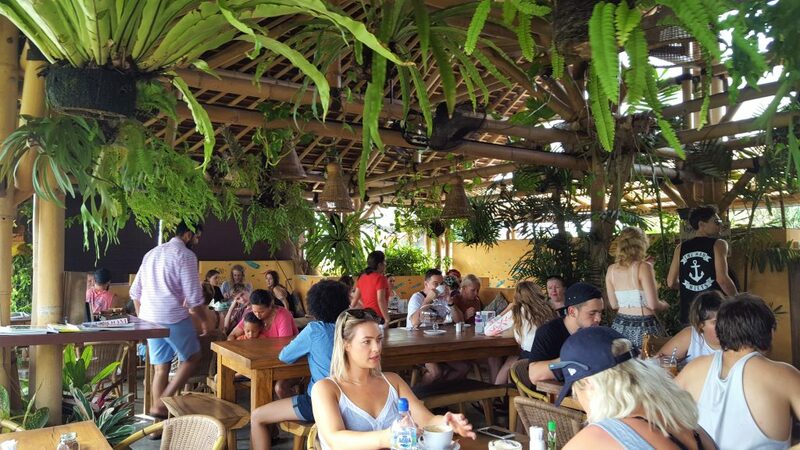 Gili Trawangan is the largest island,and is know as the ‘party island’, with loads of accommodation, restaurants and nightlife. 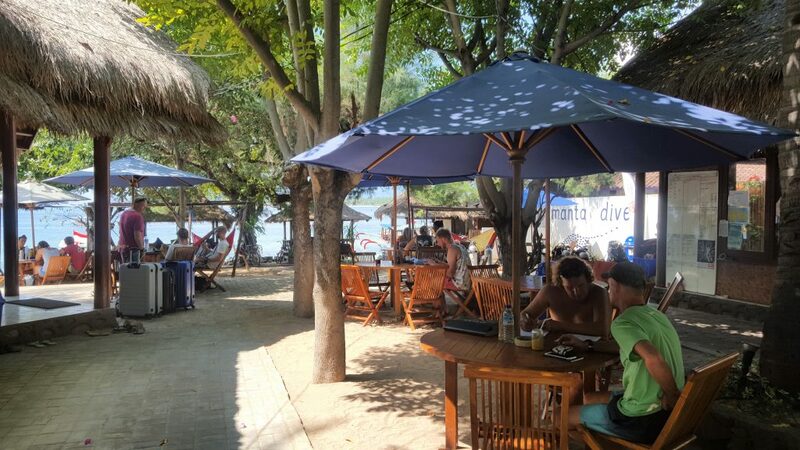 Gili Air offers a mix of the two, with plenty of restaurants and bars in the south and a more peaceful atsmophere elsewhere. We chose to stay on Gili Air. We needed a total break after a stressful time living at 100mph in London. 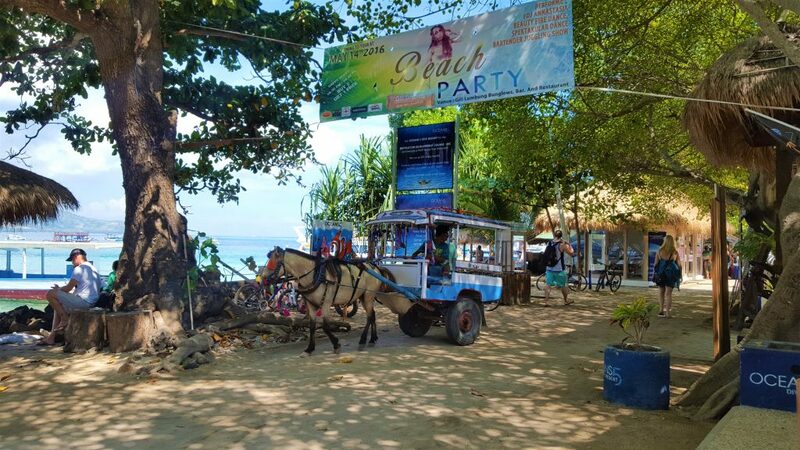 There is no traffic on these islands, the only way to get around is horse & cart or bicyle. But Gili Air is so small (just 5km circumference), we walked around it every morning in just 45 minutes. We stayed at Manta Dive on the South East coast of the island. It is situated right on the beach and was perfect for our needs. As we explored the area, one of the first things we did was get something to eat. 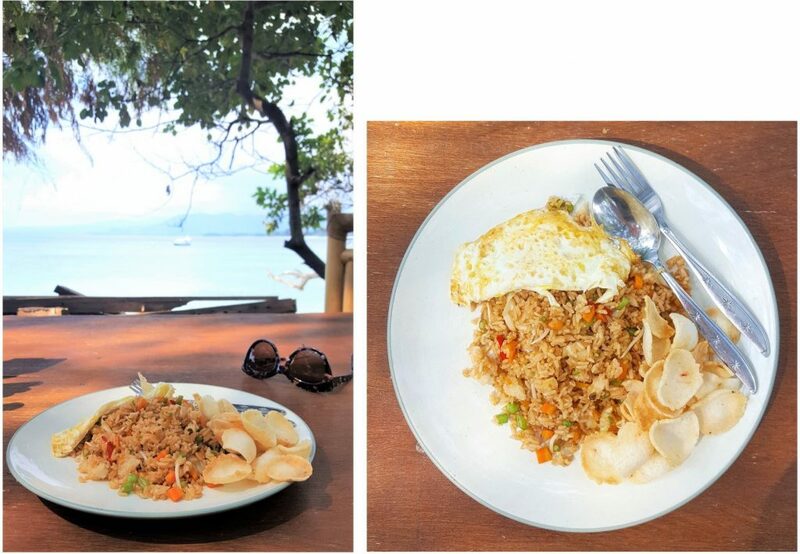 Of course, the only choice was nasi goreng (the first of many! 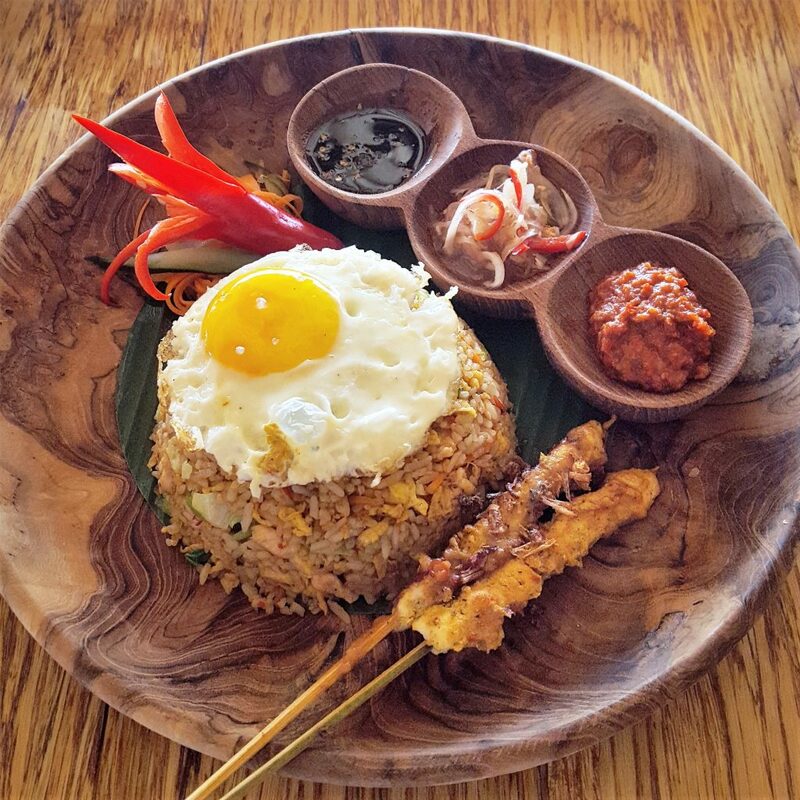 ), a fried rice dish topped with an egg…an Indonesian classic, traditionally eaten for breakfast. 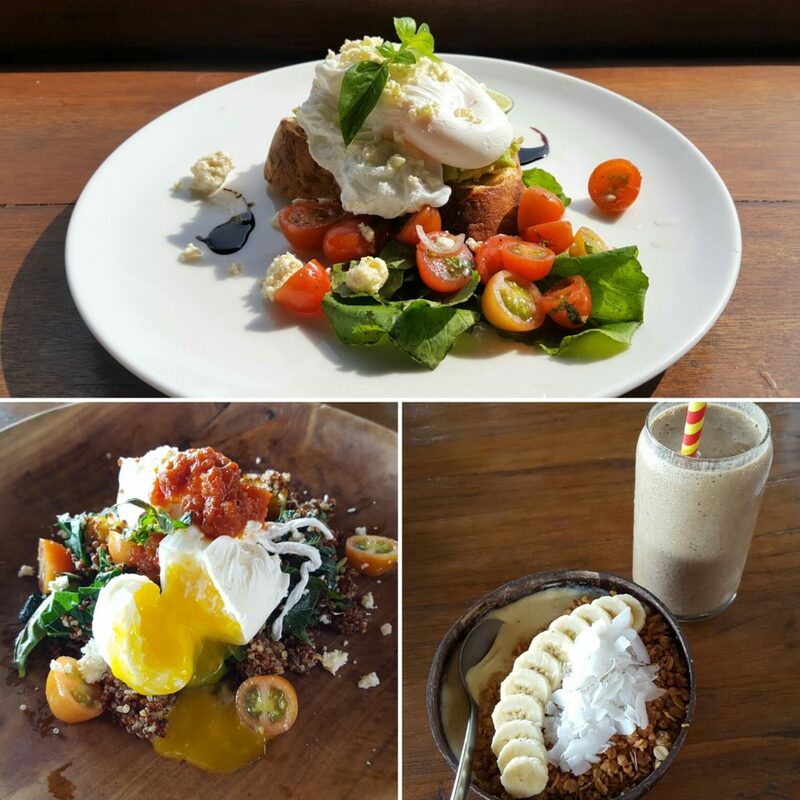 If I was to go to Gili Air again, I think I would stay at Mowie’s on the South West coast. Its not fancy by any stretch of the imagination, but it was our favourite place to hang out while we were there. 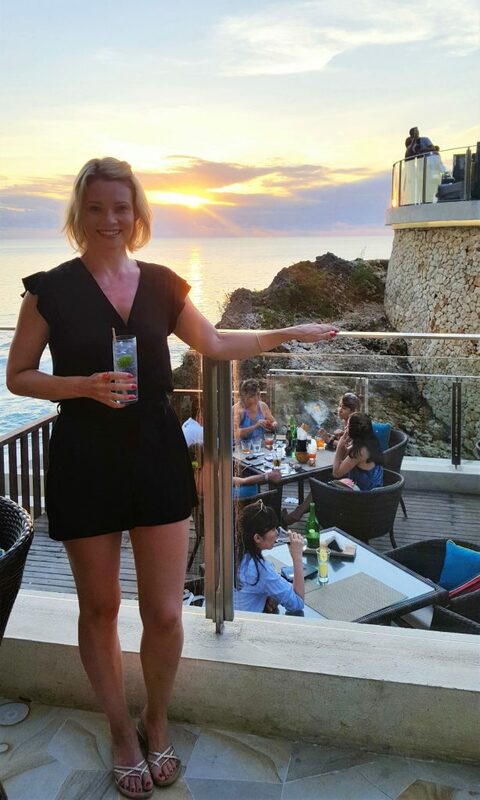 It is right on a beautiful beach, serves fantastic food and cocktails and has the most incredible sunsets I have ever seen. 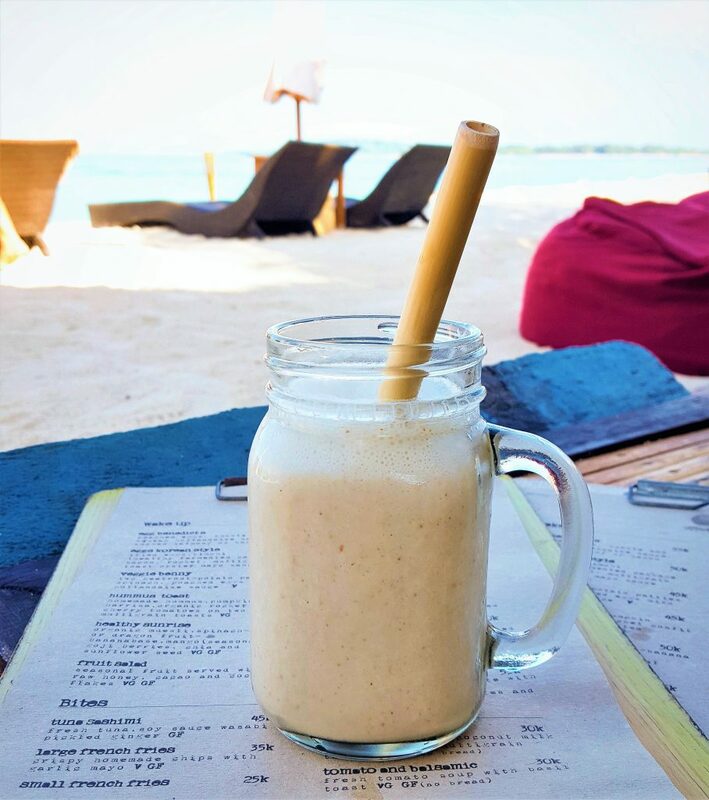 Each morning, we would finish up our walks around the island with breakfast and a power smoothie on the beach. This was my favourite, the Flaxseed Boost…almond milk, banana, flaxseeds, dates and honey. Below left is the healthy sunrise bowl…spinach and banana base topped with organic muesli, mango, goji berries, chia and sunflower seeds. And on the right, one of my favourite breakfasts of the trip…homemade hummus, pumpkin harrisa, organic rocket and confit cherry tomatoes on multigrain toast. I can’t begin to tell you how delicious this was. 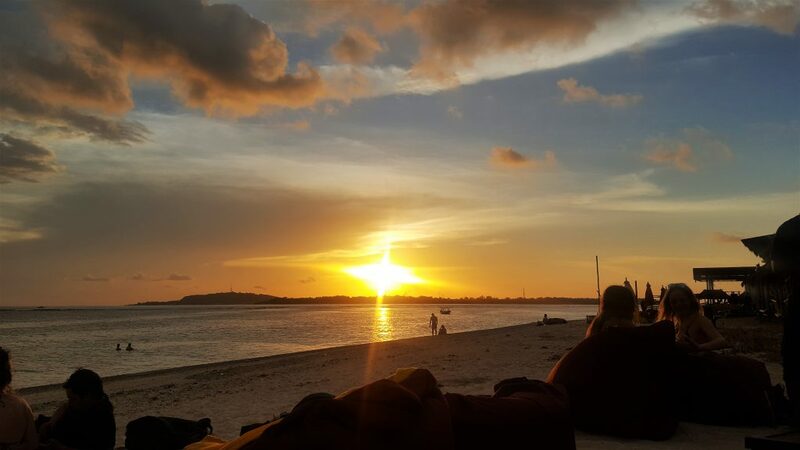 After a few days on Gili Air and a lovely day trip to Gili Meno, we said our goodbyes to this beautiful paradise and jumped on a boat to Bali. 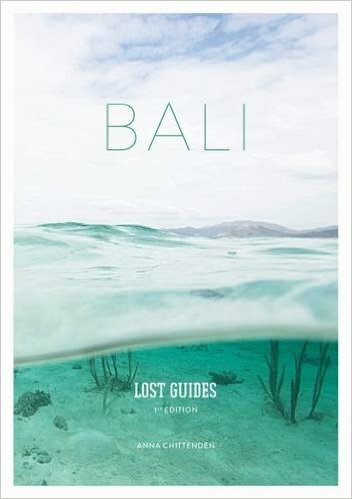 I must mention that our bible whilst travelling around Bali was Bali Lost Guides by Anna Chittenden. It is a beautifully designed travel guide for the most stylish and unique places in Bali, the best restaurants and bars and small hidden gems off the beaten track. It was a lifesaver for us. 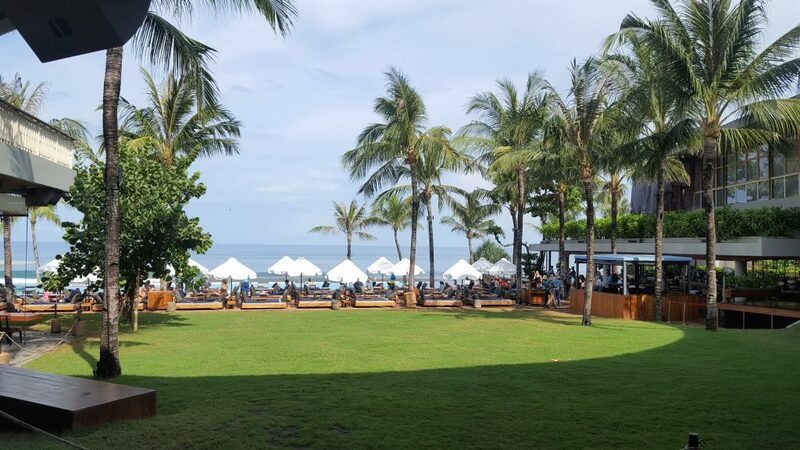 If you are planning a trip to Bali I would highly recommend it. 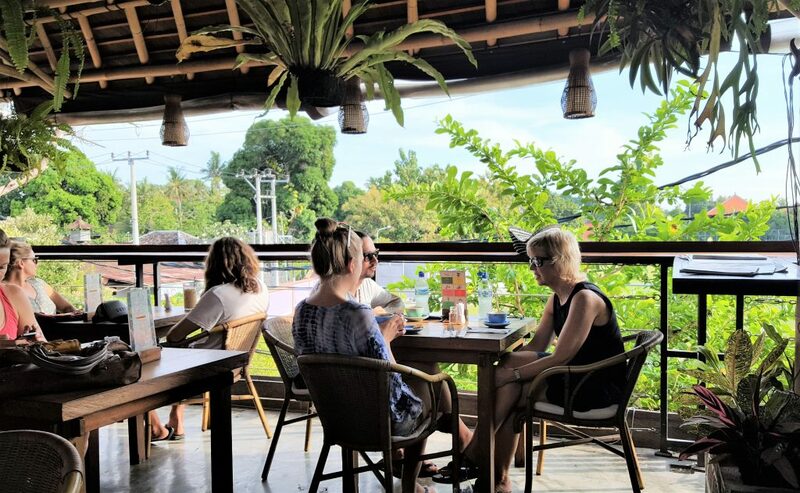 Our first adventure in Bali began in Seminyak, a bustling hive of fantastic restaurants, bars and clubs and a wealth of creative, designer shops and galleries. 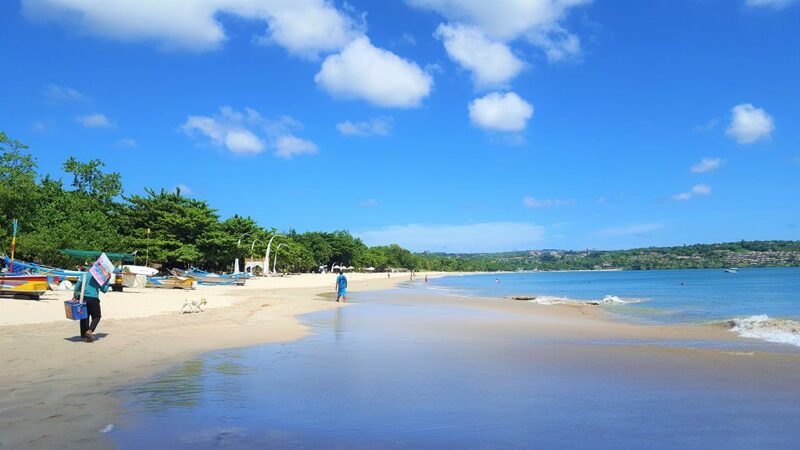 Popular with expats, world-class hotels line the wide and sandy beach. 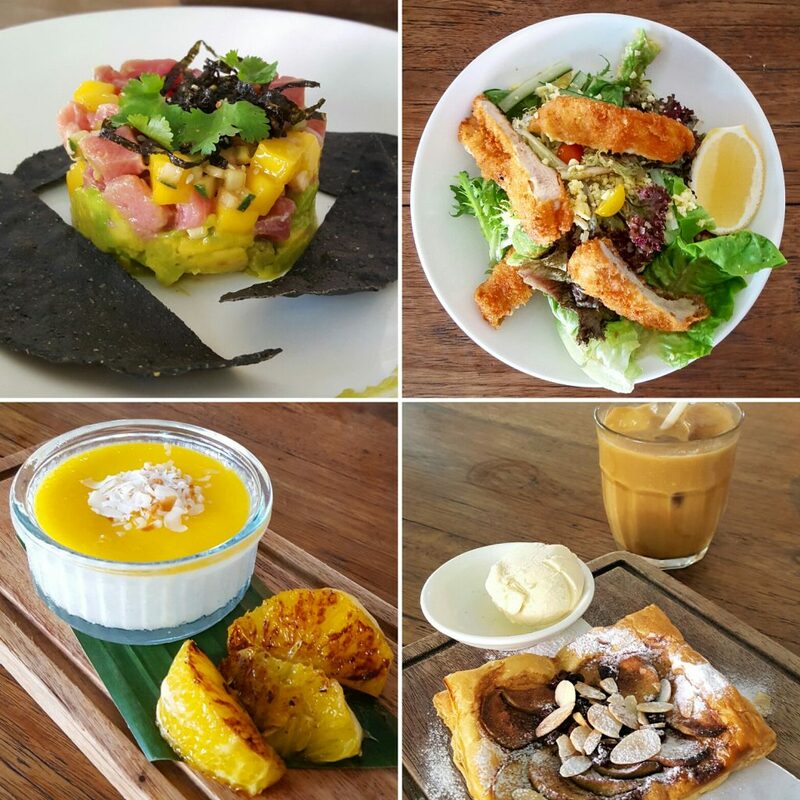 Seminyak was quite a shock to us after the peace and tranquility of Gili Air, but the food sure made up for it! Situated in the centre of Seminyak, and run by husband and wife team Magali Pascal (a French fashion designer) and Matt Neville (an Australian photographer), this stylish and airy warehouse-style building has a restaurant on the ground floor lined with bare walls and filled with fans, mis-matched tables and chairs and antique mirrors, as well as an outside terrace to the side. 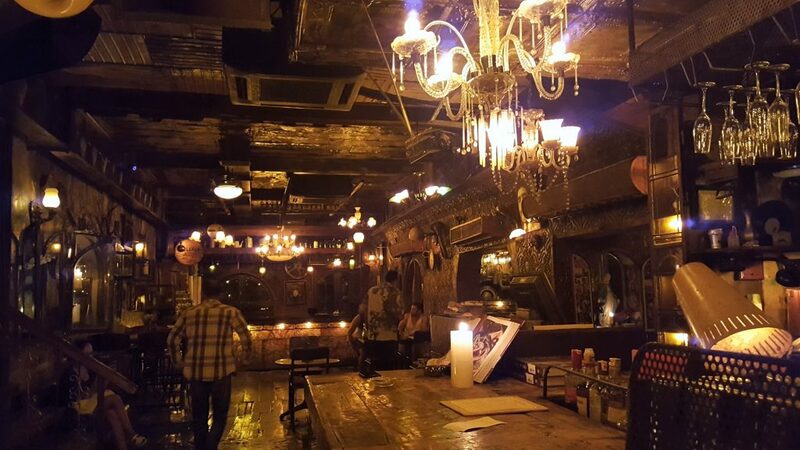 Upstairs, the bar has cushions made from original war-time hessian bags sourced in Antwerp and linen covered sofas. 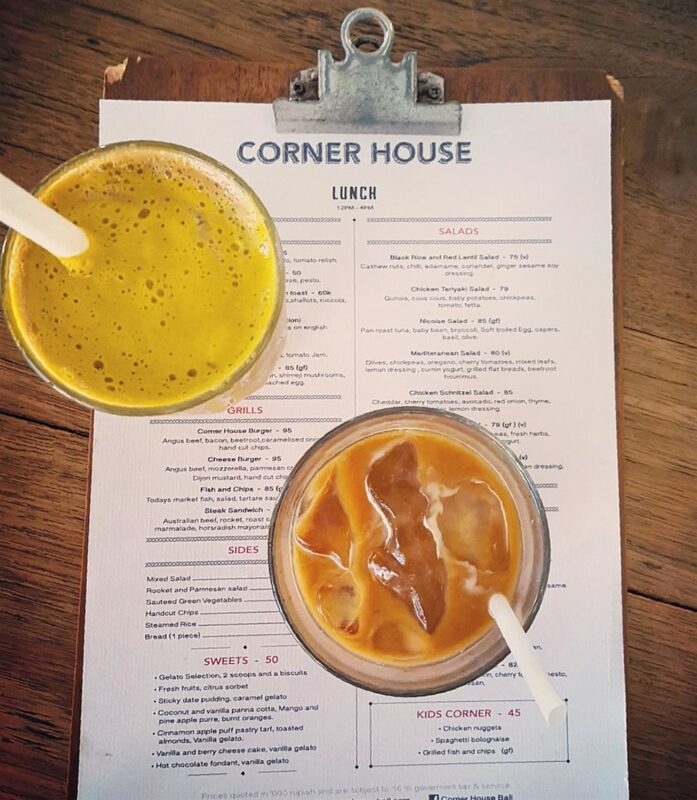 Not only is it a beautiful place to hang out in, it also has a cracking food and drink menu. On our first visit, we had the tuna tartare with avocado, mango, cucumber and shallots with a ponzu, soy and sesame dressing | chicken schnitzel salad with cheddar cheese, cherry tomatoes, avocado and red onion with a thyme, parsley and lemon dressing | cinnamon apple puff pastry tart with toasted almonds and vanilla gelato | coconut and vanilla panna cotta with mango and pine apple puree and burnt oranges. 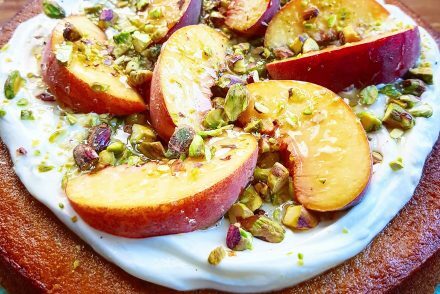 The next time we went along for brunch I had the Corn Fritter Stack with poached egg, hallumi, bacon, avocado and tomato relish and Buckwheat Pancakes with rhubard comote, fresh fruits, granola and maple vanilla butter. 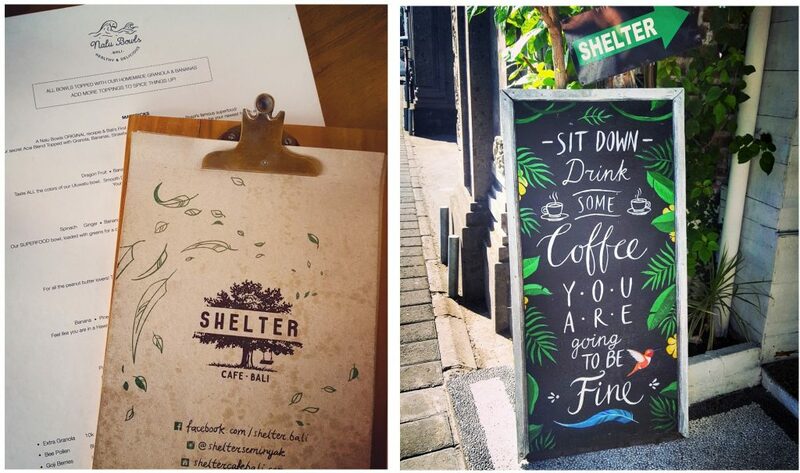 Just around the corner from our villa was Shelter Cafe, another favourite of ours. 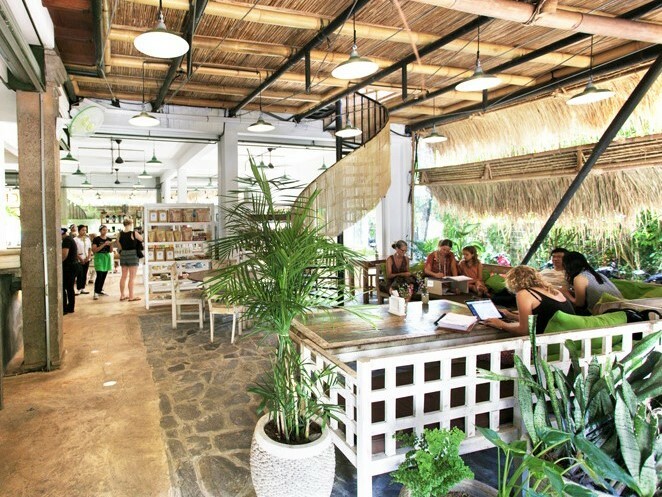 Shelter is a gorgeous roof top garden cafe in the heart of Seminyak, situated above the very popular Nalu Bowls, which makes coconut shells filled with fruit. It is a peaceful oasis of calm just a stones throw from the busy streets. Seriously…how gorgeous is this place? I couldn’t go there and not get a nalu bowl so I went for the Maverick…an acai bowl topped with granola, bananas, strawberries, coconut flake and honey. I also got a super-charged smoothie made with frozen banana, almond milk, coconut milk, almond butter, chai spice, cinnamon, maca powder, flax seed and dates. 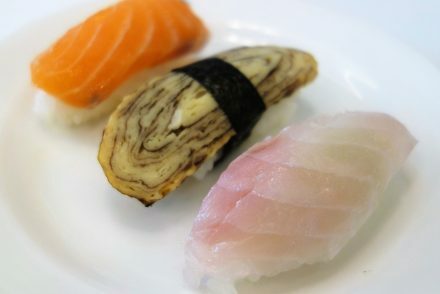 Of course, I had to take about 20 photos of it before I ate it! We went to Shelter a few times during our trip so I also had smashed avocado and poached eggs on toast with cherry tomatoes, feta, mint, dill, rocket and lime (top) and ‘Quinoa Heaven’…two poached eggs, red & white organic quinoa, roasted pumpkin, sauteed spinach, cherry tomatoes, feta, basil and tomato chutney. 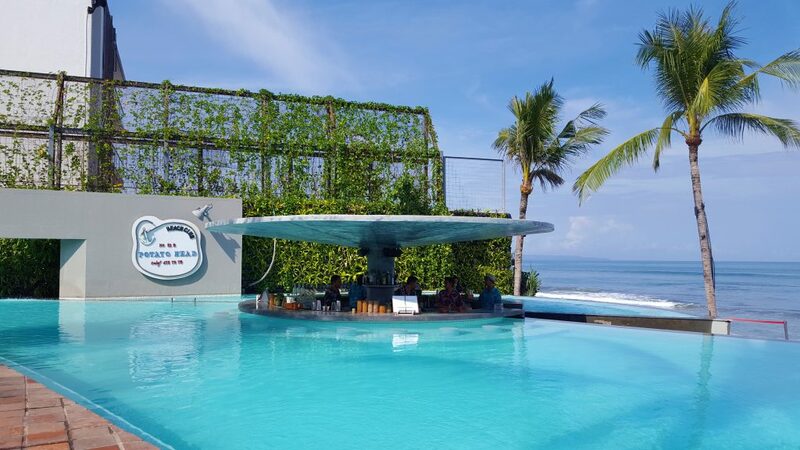 For the day of my birthday we wanted to go somewhere special so we headed to Potato Head Beach Club, an iconic landmark in Seminyak. Potato Head is a super cool, huge open air space set alongside a huge sandy beach, with a long, turquoise infinity pool overlooking the ocean, serving really tasty food and fantastic cocktails. 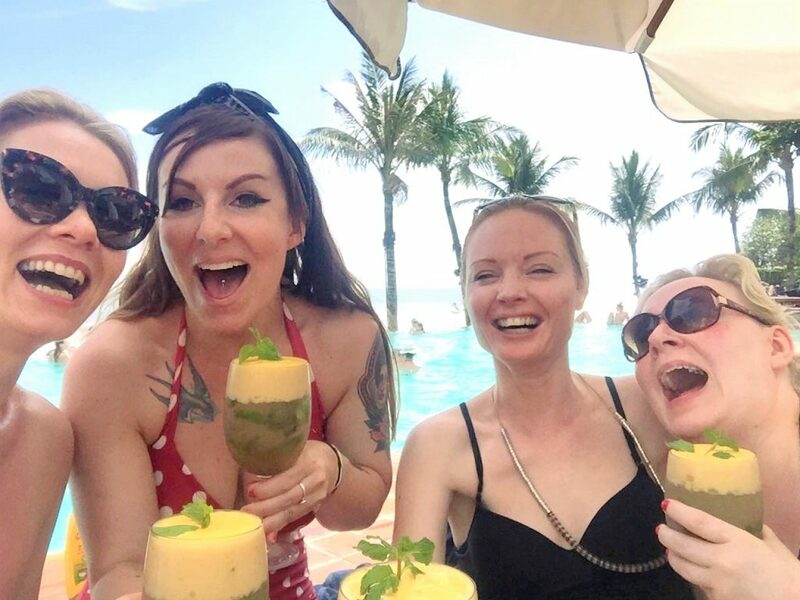 We were lucky enough to get a day bed right next to the pool and we spent the day sunbathing, drinking champagne, swimming, and drinking at the pool bar on submerged bar stools. 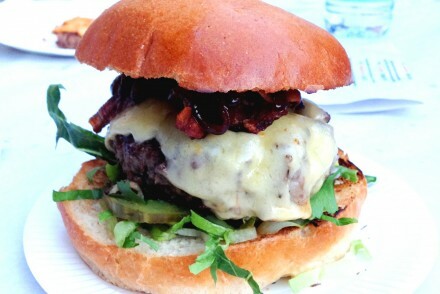 Whilst there I had one of the BEST burgers I have ever had, courtesy of Three Buns, who were doing a collabration with Potato Head. The ‘Fun Boy Three’ was made up of aged beef patty, roasted portobello mushroom, garlic and miso butter, smoked cheese, ketchup and truffle aioli in a brioche bun. Damn, it was good. The ceviche (right) was beautifully light, zesty and fresh. My friends and I carried on celebrating for the rest of the day with ridiculously delicious cocktails. After a glorious day in the sun, as we were heading back to our villa to get changed for my birthday dinner, the heavens opened and suddenly a tropical thunderstorm stopped us in our tracks. 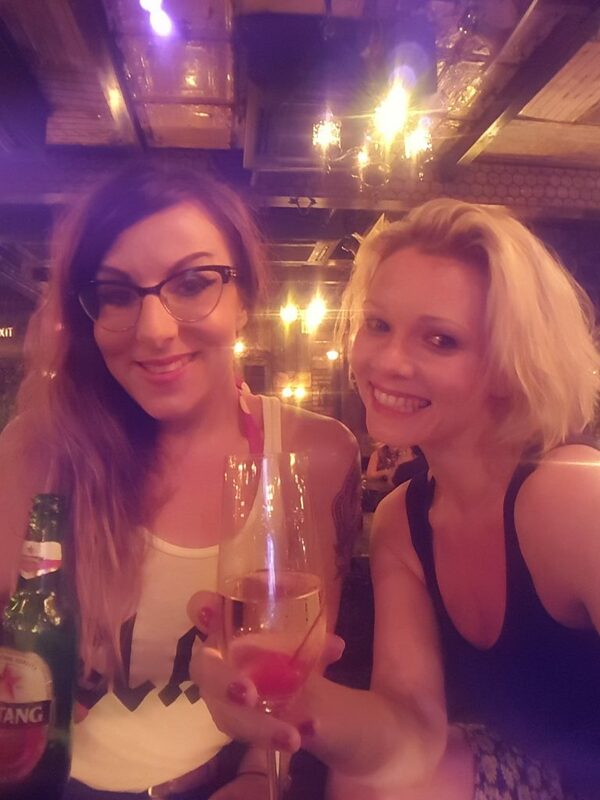 We grabbed a taxi but the weather caused gridlock on the main street in Seminyak so my friend Cassie and I decided to jump out and take shelter in La Favela. 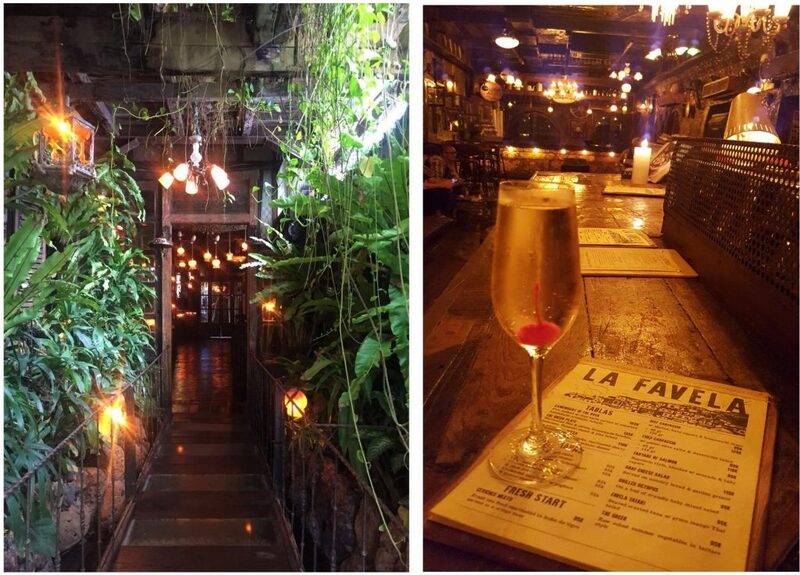 La Favela is a restaurant and club which kinda looks like a long forgotten colonial building located at the edge of Brazilian rainforest. Inside, its a treasure trove of retro and antique furniture, chandeliers and table lamps, plants that seem to grow everywhere, old bikes, scooters and even an worn out Volkswagen van. 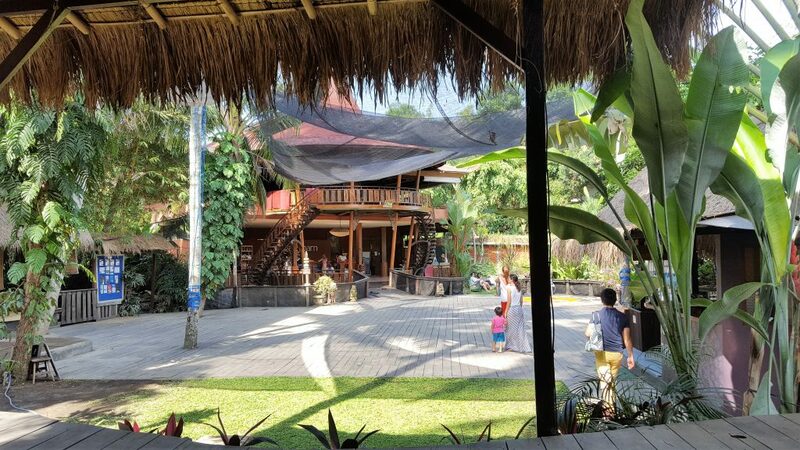 You could almost forget you’re in Bali, except for the noise of the rain hammering down on the garden restaurant out back. We were just stopping for a few drinks so we sat at the bar and ordered a couple of small plates of food before our main meal next door. 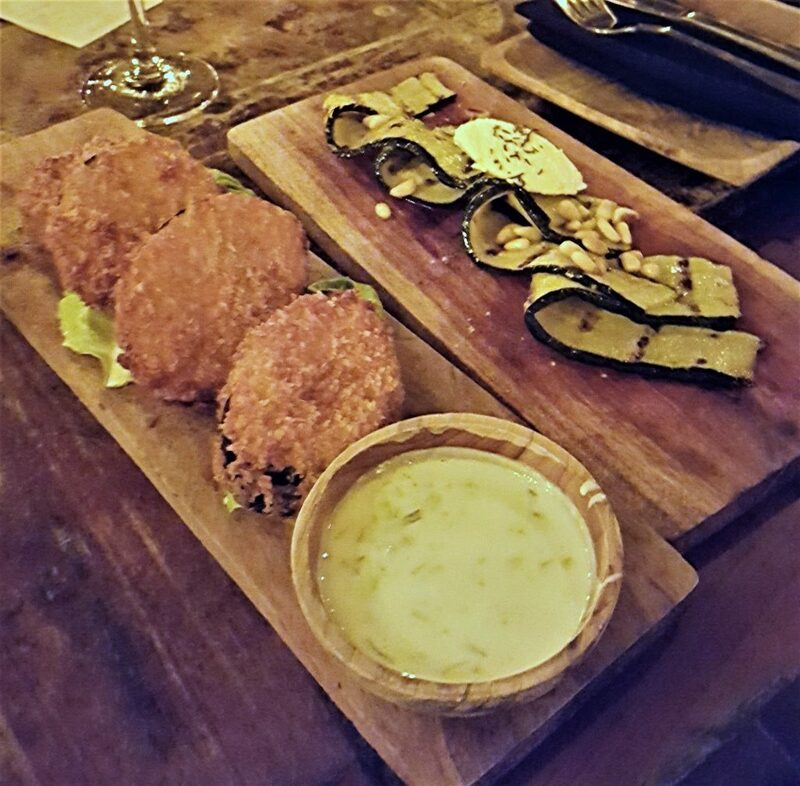 It was a shame we weren’t staying in Seminyak long enough to go back there for a proper meal as their small plates were so good. After a few glasses of champagne, and the sound of the rain battering down outside, so much so that water was flowing into the bar (! ), we realised that we weren’t going back to the villa to get changed. So much for my birthday outfit I laid out that morning. I ended up spending the evening in my damp bikini, vest top, shorts and flip flops! 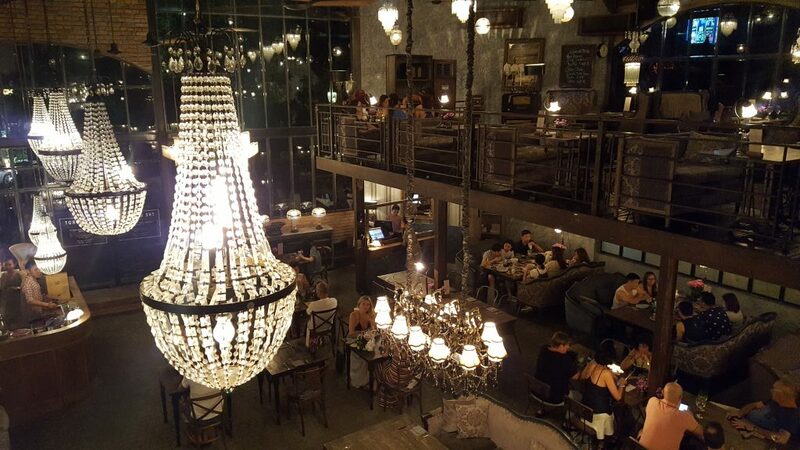 After my other friends joined us, we headed next door to The Bistrot, a stunning high ceilinged open space, loft/factory space with an industrial feel and a plethora of chandeliers. The antique furnishings are sourced from around the Indonesian archipelago, most being from the owners personal collection. 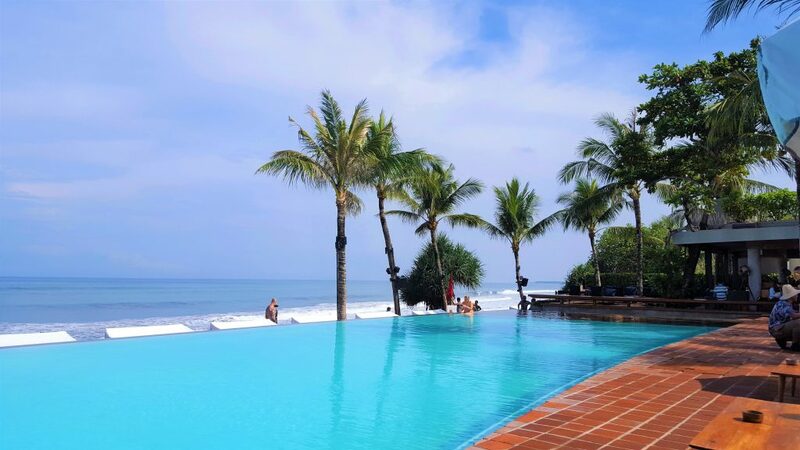 Canggu (pronounced Chang-goo) is a small, super cool, chilled village on the beach about 20 minutes north of Seminyak. 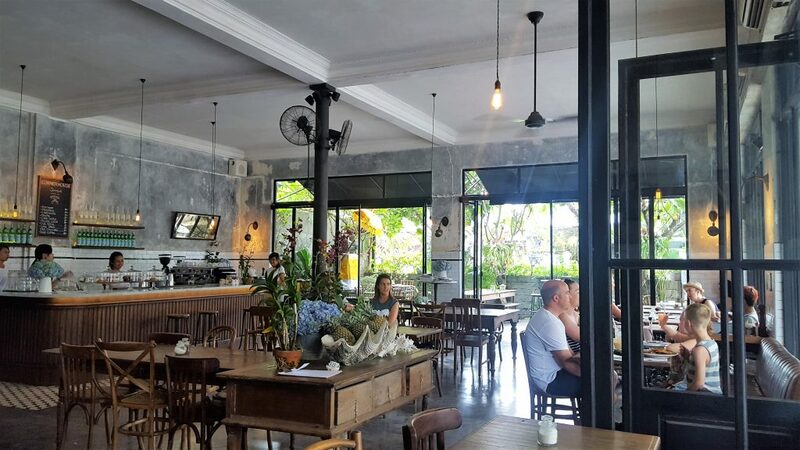 Its like the trendy, low-key sister to Seminyak, filled with young, beautiful surfers who gather in the many hip and healthy organic cafes and coffee hangouts. 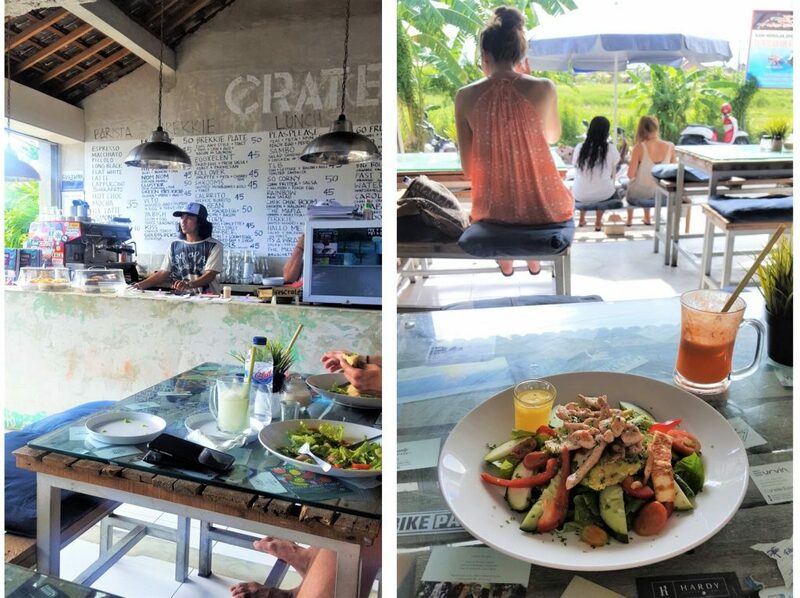 If I was to go back to this area I’d probably stay in Canggu, knowing I could easily pop to Seminyak if I wanted to. I was only there for a few hours so I grabbed a chicken salad and juice at Crate Cafe. 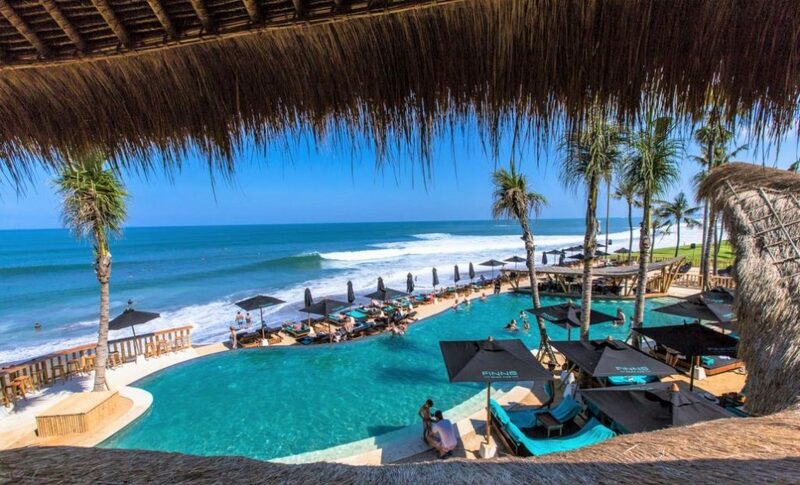 After lunch I headed to nearby Finns Beach Club, a gorgeous beachfront club situated in front of the famous Berawa surf break. 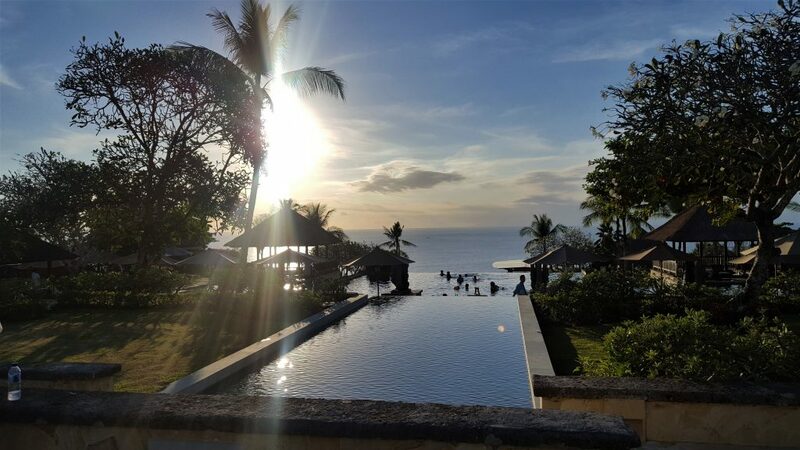 You can laze away the day in the sun from the comfort of single and double day beds on a white sand beach or swim in the infinity pool with swim up pool bar and underwater speakers. The bamboo structure was specifically designed to allow every guest to have a guaranteed sunset view. Yet again, I ordered another delicious nasi goreng. I can’t get enough of this stuff! 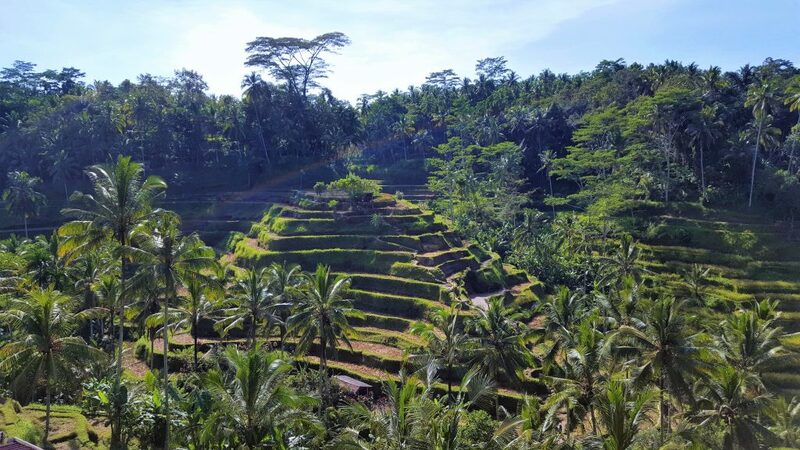 After my time in Seminyak I was ready for a little culture, peace and relaxation so we packed our bags and headed to Ubud (pronounced oo-bood) in the centre of the island, right in the middle of the jungle. I nearly cried when I arrived, it was so beautiful. I immediately felt at home and wanted to live there. This was the view from our bedroom in Luxe Villas. 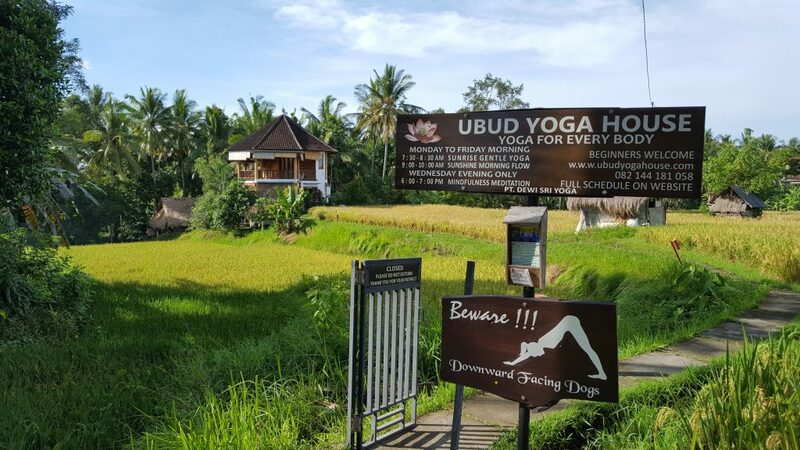 On my first morning in Ubud, I headed to a sunrise yoga class at Ubud Yoga House. There is nothing more relaxing than practising yoga as the sun comes up, with 360° views of lush, green rice paddies and the sounds of roosters crowing. …I caught up with the lovely Fiona Barrows. I know Fiona from London but she was living in Ubud while I was there so we had a catch up over a pulled pork ciabatta stuffed with slow-braised pork shoulder, barbecue sauce, coleslaw, and curry maison mayonnaise at Locavore To Go, the take out offshoot of Locavore Restaurant just a couple of doors up the road. 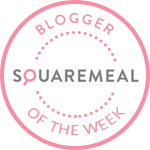 The next day I headed for a vegan experience at Alchemy, which offers a delicious and inventive vegan menu, and in which you feel healthy just being there! 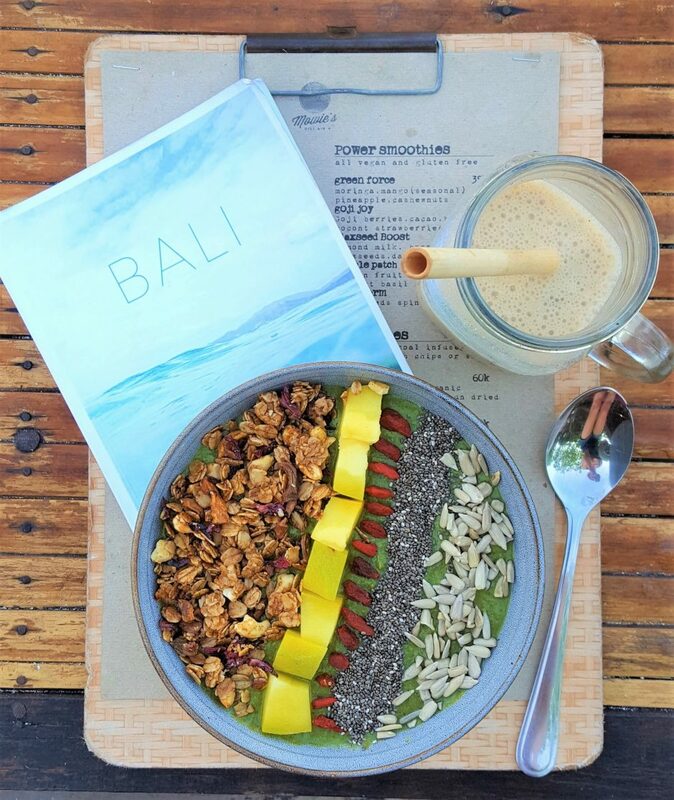 As the Bali Lost Guide says, ‘If there’s anywhere that can convince you to change your meat-eating ways and become a fully-fledged vegan, its Alchemy’. 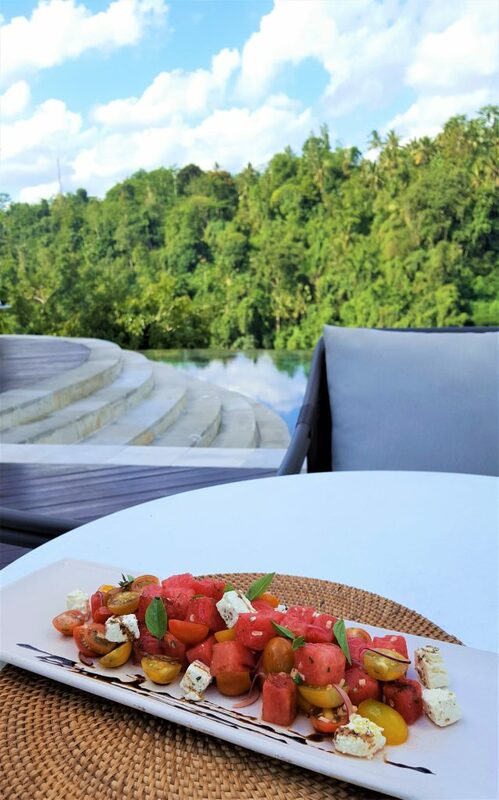 It all tasted so fresh and light and to be honest, if I lived in Ubud, I could see myself living pretty much meat-free. 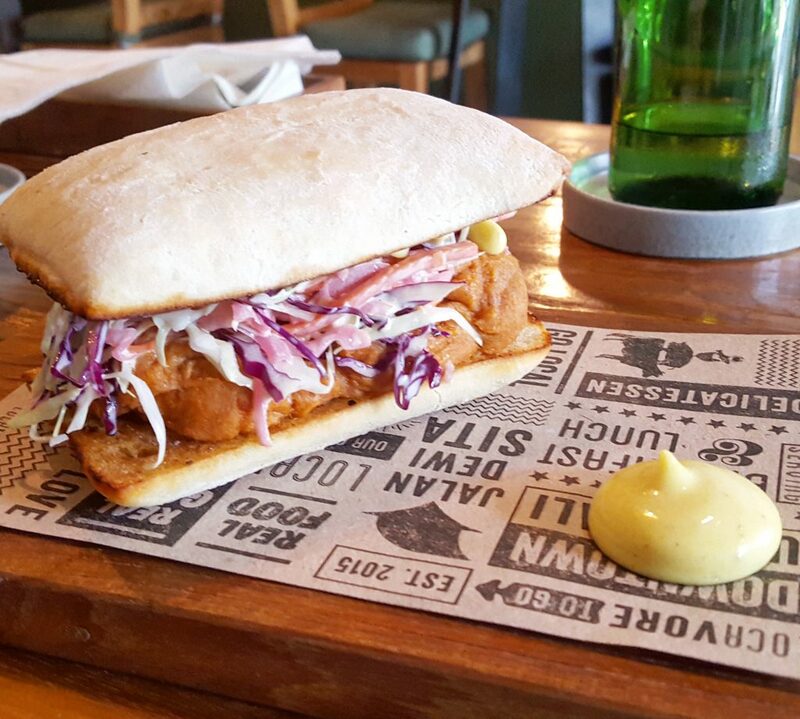 There are just so many enticing veggie and vegan options to choose from. 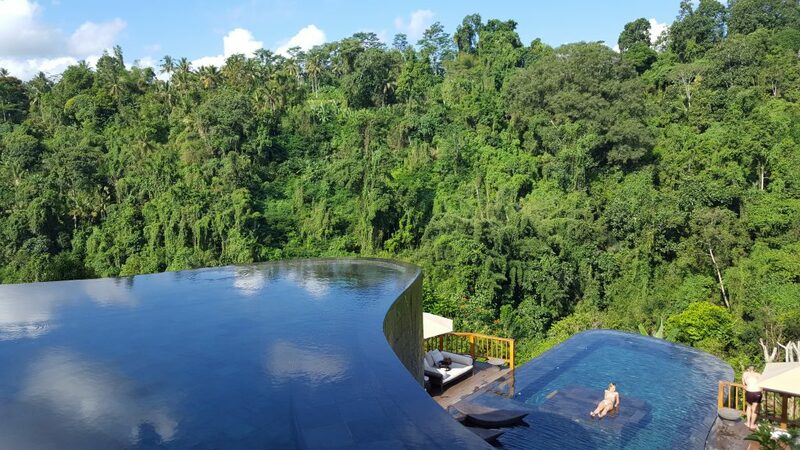 Another of those ‘must see’ places in Ubud is the famous and jawdropping Hanging Gardens of Bali, the world’s first 7* boutique hotel, and home of a stunning twin-tiered cascading pool…the ‘World’s Best Swimming Pool’ according to Condé Nast Traveller. This is not one of those hotels you can just wander into to take a look around, you have to buy a package to get inside. I chose the cheapest package (that still wasn’t cheap!) which included lunch in the restaurant, although I wasn’t flush enough to afford the package that allowed access to the award winning pool. I just looked at it enviably as I savoured my feta, watermelon and mint salad. I spent the next day at the blissfully relaxing Yoga Barn. This is a haven in paradise. If you’re ever in Ubud, please take a class there, its just enchanting. I attended a Tibetan singing bowl meditation class while I was there and I have never felt so relaxed. Everyone in the class lay on the floor in a large circle, heads on the inside of the circle, feet facing out towards the walls. The singing bowls have the ability to induce an immediate deeply meditative state. This music therapy relaxes both body and mind from stress and tension and the vibration of the Tibetan Bowls is designed to clear and balance one’s chakra. I was so relaxed afterwards I felt stoned. I could barely move except to grab a coconut and sit in a bean bag taking it all in. 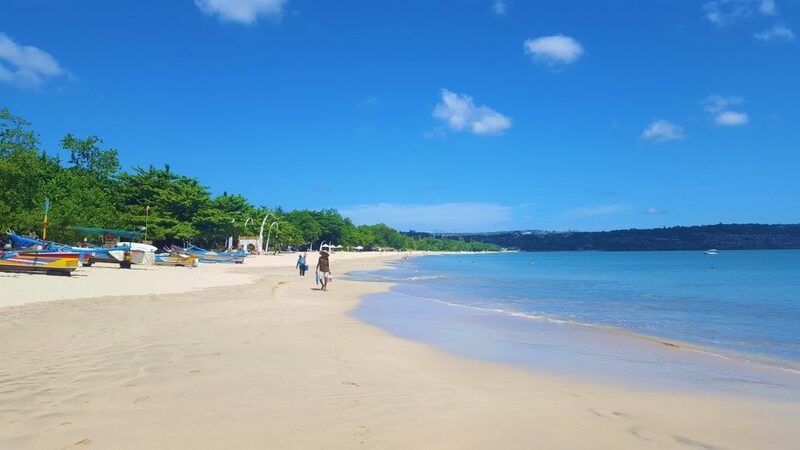 We arrived at Jimbaran Bay, located on Bali’s southwestern coast of the narrow isthmus connecting the Bali mainland and the Bukit Peninsula, and immediately headed for the beach. We couldn’t believe how lucky we were! 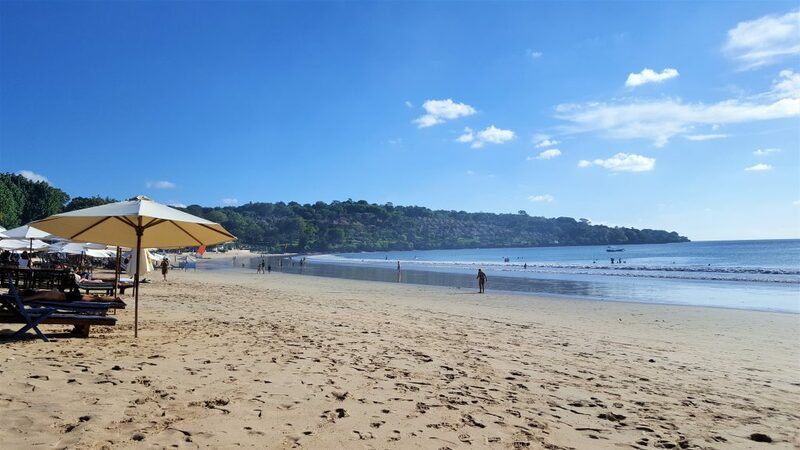 Jimbaran was formerly a real backwater of south Bali, just a tiny fishing village with a daily market. 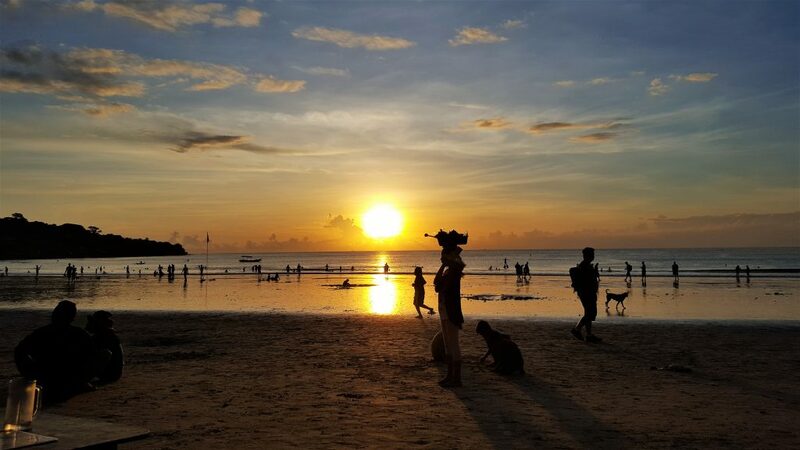 However, that all started to change in the 1980s and Jimbaran is now home to several world class 5* beach resorts, plus a few more moderate mid-market hotels. There are also many high-end villas in this area, particularly on the ridges of high ground above Jimbaran Bay. This has resulted in monikers such as the “Beverly Hills of Bali” or “Millionaire’s Row”. 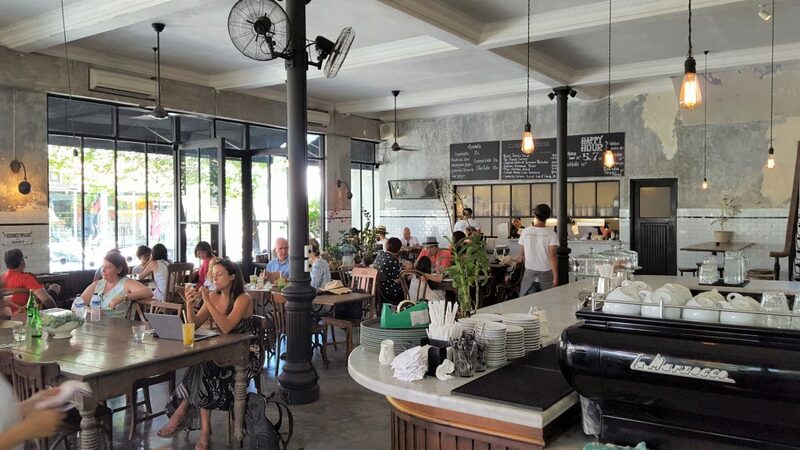 Jimbaran has an increasing number of rather chic shops but there is little to no nightlife there. Nights are spent on the beach, in one of the excellent seafood restaurants watching the sun setting. 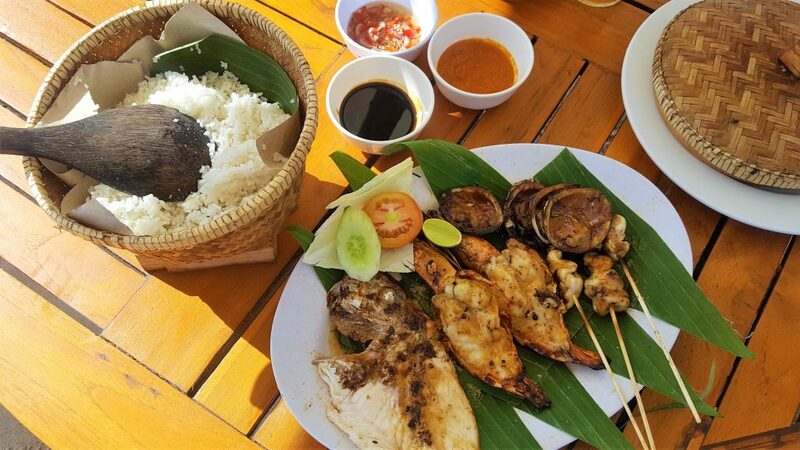 One of the best meals we had there was this grilled seafood plate at Menega Cafe, right on the beach itself. We decided to go somewhere a bit fancy for our last night, so we headed to the iconic Rock Bar at the AYANA Resort & Spa. When we arrived, we were guided through the breathtaking resort, stopping every now and then to take in our incredible surroundings. The AYANA Resort boasts 18 restaurants and bars, an exclusive private beach, 12 swimming pools, a world-class spa, therapy pool and spa. 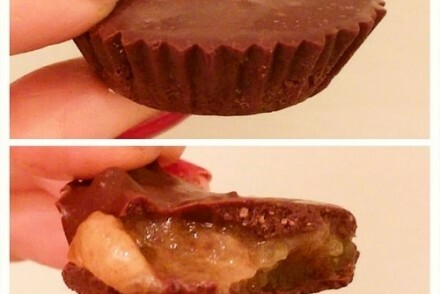 Its amazing. Rock Bar is perched right on top of the cliff and is is widely known as one of the world’s most popular sunset, cocktail and entertainment venues. We accessed it via AYANA’s cliff side inclinator and were shown to our table overlooking the ocean and their custom DJ booth carved directly into the cliff face. And so, our trip of a lifetime was over, and we had to head back home to London. The one line that kept going through my head throughout the trip was “I don’t want to leave, I belong here”, and I still feel like that. 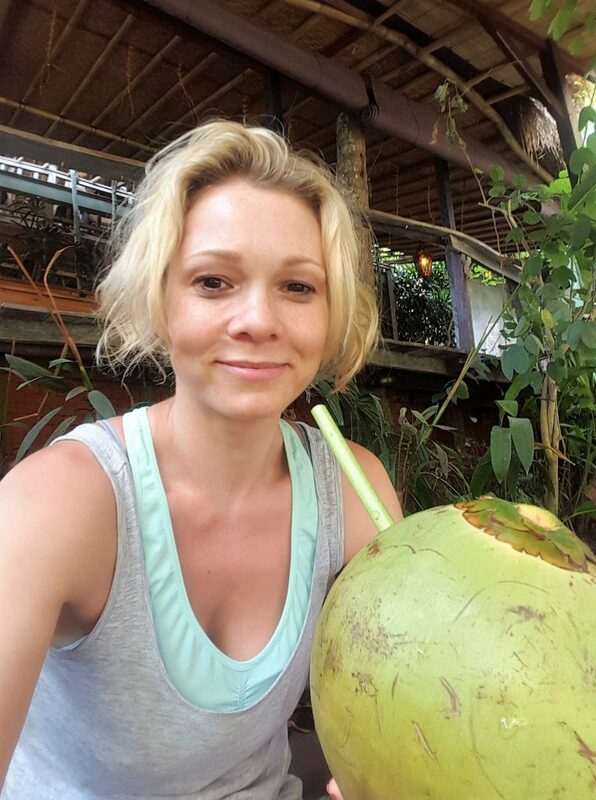 In fact, I started to plan a permanent move to Bali when I got home, but unfortunately, I contracted dengue fever while I was in Bali, and it came on full-force on the journey home. Literally on the way to the airport! And so began the WORST journey I have ever had. Nausea, migraines, muscle and joint pain, fever, exhaustion…it was horrific. It turns out you can contract dengue fever (by mosquito bite) and symptoms typically appear 3-14 days after infection. I am typically eaten alive when I am anywhere near mosquitos and on this trip I counted over 140 bites…and they were huge! It was not attractive. 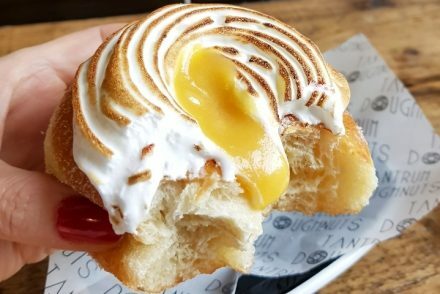 Strangers actually approached me on the street to ask if I was ok because they couldn’t believe the number of bites I had. Aaaanyway, my friend Jane (who also showed signs of dengue fever about 2 hours after me) and I somehow flew from Bali to London with a stopover in Singapore (where we literally lay on the floor in a fevered mess! ), got our Addison Lee taxi to our homes and collapsed. The next 2-3 weeks were hell. You do NOT want to get dengue, its vile. Saying that, I would not let that ever put you off going to Bali. It is unusual to contract dengue. When I lived there for a month a few years ago, I certainly didn’t get it. Just make sure if you do go…you wear deet or some other strong mosquito repellant both during the day and in the evenings, and don’t spend too much time hanging around harbours. Its by the water those mosquitos tend to congregate. I think my mistake was not wearing mosquito repellant during the day. Dengue fever aside, this was the most awe-inspiring, phenomenal and wondrous trip I have ever had. 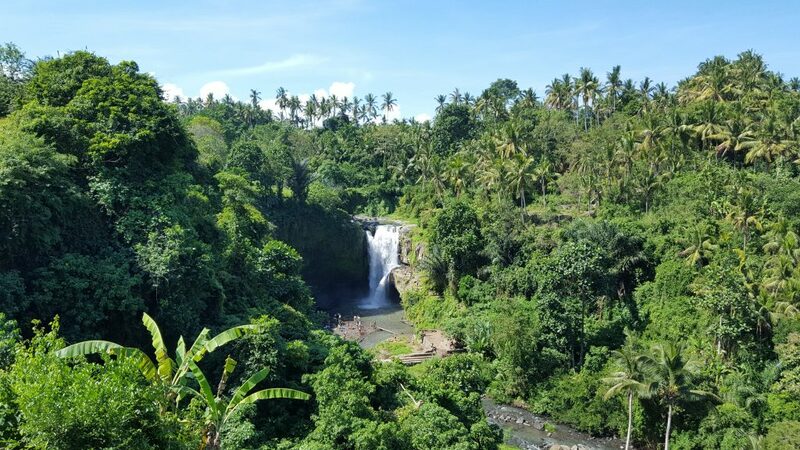 Bali is a very special and extraordinary place, with so much to see and do. You could go many times and have a completely different experience each time. I felt like I had 4 holidays in one on this trip as each place we went had such a different vibe, and I still haven’t scratched the surface of this breathtaking island. There were so many restaurants I didn’t get a chance to eat in, and so many places I didn’t get a chance to go to. I want to keep coming back again and again (with more mosquito repellant next time!). Ohh my goodness I absolutely love this post. 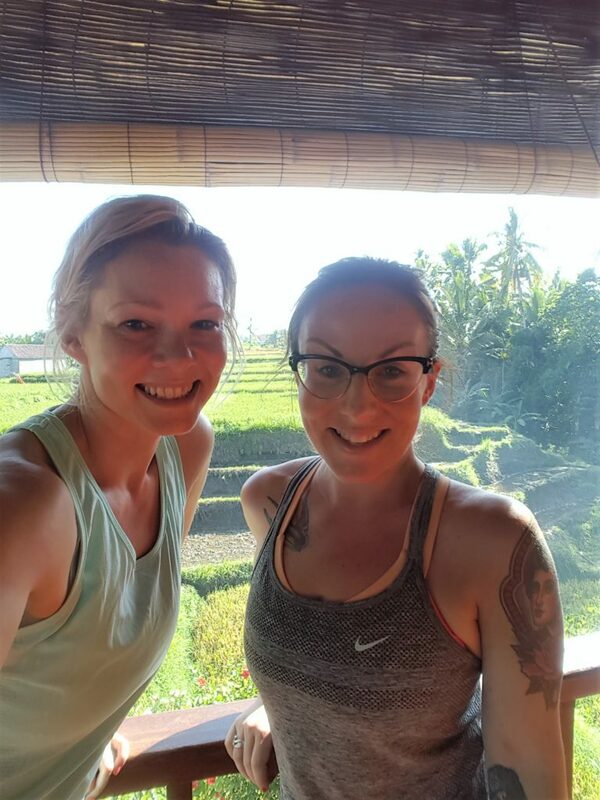 I really enjoyed learning about Bali and your adventures, sorry to hear about dengue fever at the end but it looks like it was all worth it. 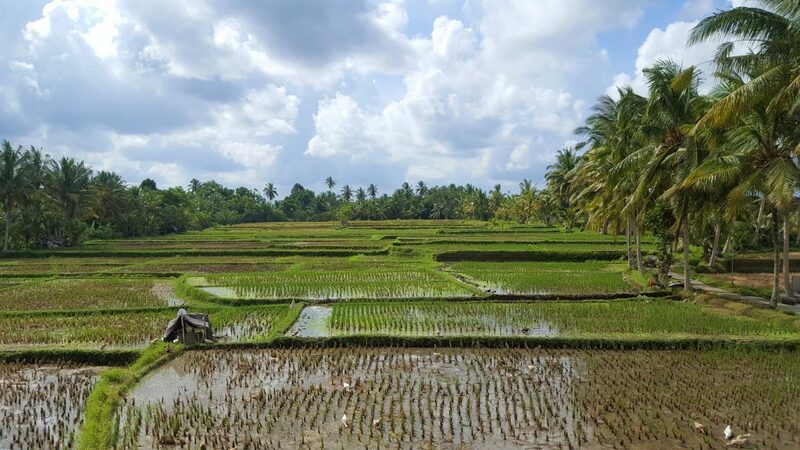 You haven’t been to Sri Lanka and Ahappened to write a wonderful post on it, have you ? wow liked your writing style. your photgraphs of locations are very nice. 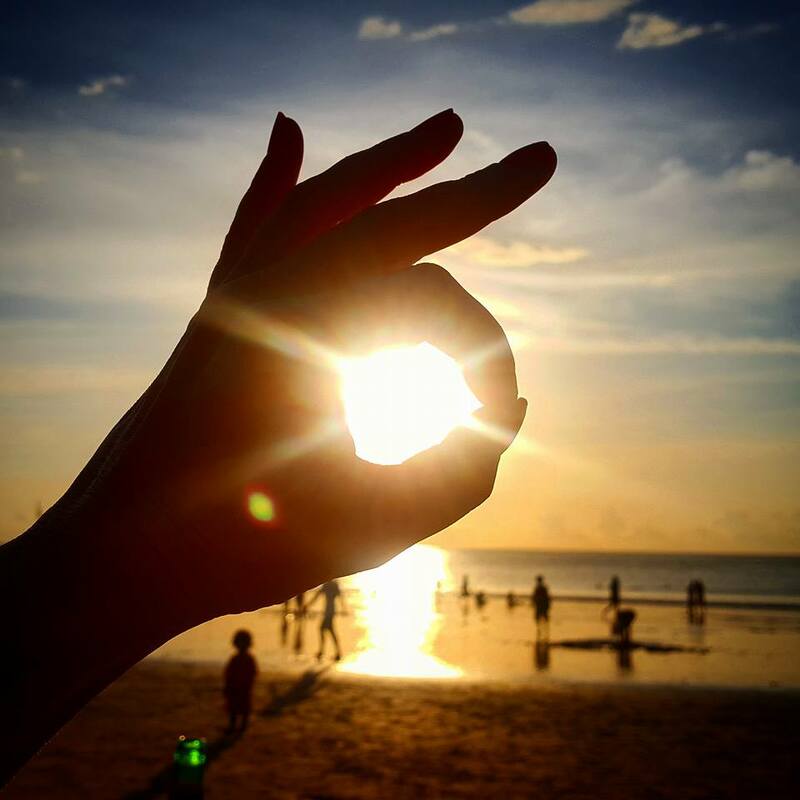 Bali is a perfect place for vacation, and this is in my country, Indonesia. 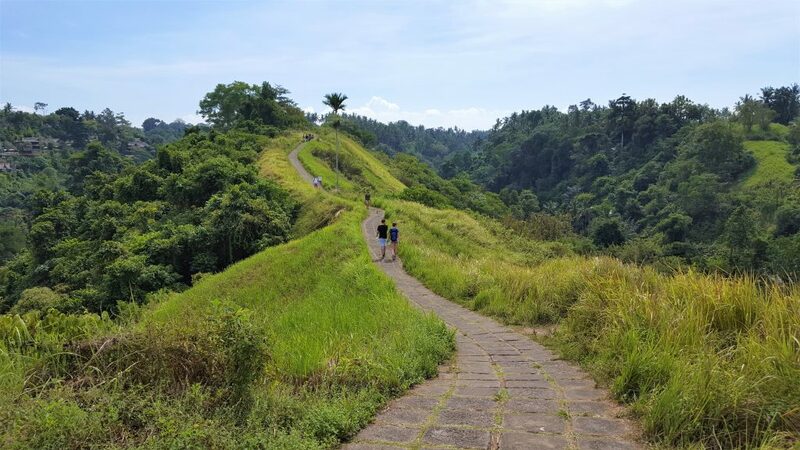 Like Ubud as one of the best village in Bali, and there are many objects that you can see. Visit Bali and Visit Indonesia.